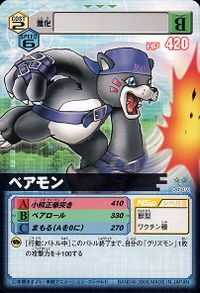 A Beast Digimon with the appearance of a bear-cub, whose trademark is its baseball cap which is worn backwards. Although it is a little timid at first, it immediately becomes bosom buddies with other Digimon. However, once it begins to battle, with the uncommon physical strength and will-power it possesses—to continue battling no matter what kind of attack it suffers—it becomes a very reliable being. The ability for close combat hidden within its body is very strong, to the point that it bound its fists in leather belts so that its special punches wouldn't hurt itself. Its Special Move is driving a punch into the opponent's chest with all its strength (Koguma Seikendzuki). Belongs to the Beast Digimon. Gryzmon's younger brother. Best friends with the Human Kotemon. It is kind but timid, and wishes for the conflict to end. Together with Kotemon, it tried its best to resurrect Ornismon. n., Any of the plantigrade, carnivorous or omnivorous mammals of the family Ursidae. Koguma Seikendzuki  Bear-cub Punch 小熊正拳突き N/A Bear Fist/Karate Fist Punches at the foe with all its might. Attacks the enemy with its claws. ベアロール Bea Rōru Bear Roll Curls up and rolls into the enemy at high speed. 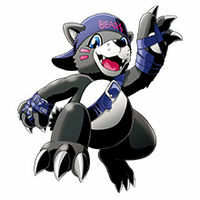 Bearmon was the younger brother of Gryzmon, commander of the beast-type Digimon on the Wandering Island. He was friends with Kotemon of the human-type Digimon, which put the two at odds with their brothers. 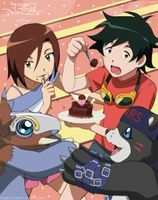 He meets Orimoto Izumi and Minamoto Kouji when they first arrive on the Wandering Island, and assists them in meeting up with the other Chosen Children and reconstructing a mural at the heart of the Wandering Island. 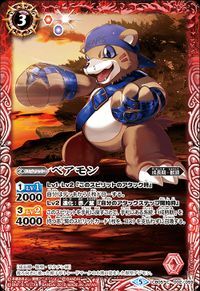 When he sees Kotemon killed by Ornismon he gives out a cry that is heard by Ancient Greymon and Ancient Garurumon and they awaken to defeat Ornismon. 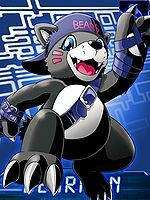 Bearmon in Digimon Adventure tri..
Several Bearmon inhabited the Volcano Zone and were forced to slave away by Ancient Volcamon trying to find the hidden Code Crown. One of them escaped and encountered Dorulumon, prompting him to assist Xros Heart. 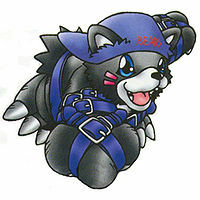 Bearmon is the Partner Digimon of Nishijima Daigo. 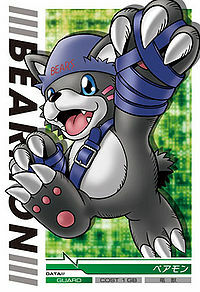 Bearmon is a starter Digimon, available in the Maniac Pack alongside Guilmon and Patamon. 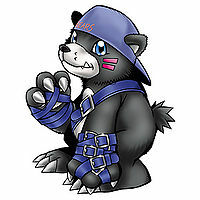 At Level 5, Bearmon gains the ability to evolve to Gryzmon. 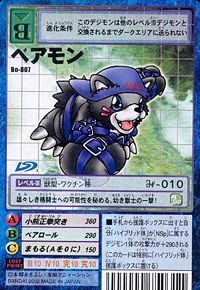 If the player didn't pick the Maniac Pack, Bearmon is still available by defeating Grappu Leomon and taking the rewarded data to Bearmon's DRI Agent. In the opening video, a Bearmon Jogresses with a Guilmon when menaced by Beelzebumon, forming Dukemon and engaging him in battle. 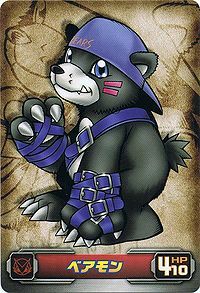 Bearmon cannot be encountered and obtained directly, but it can be obtained by devolving a Gryzmon from Bug Bug Jungle or Leomon from Old Canyon. He can evolve into Gryzmon if above level 15, or Leomon if above level 32 with 180+ Attack. An NPC Bearmon gives you a request mission to bring his friend Kotemon from Cliff Valley to his DigiFarm. 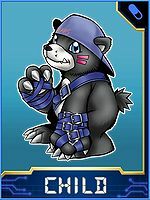 Bearmon can be evolved from Wanyamon if above level 10, and can evolve to Gryzmon if above level 19 with 390 Beast EXP, or Mojyamon if above level 21 with 220 Beast EXP and 180 Water EXP. 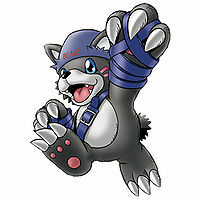 Bearmon is available as a Digimon Medal. It also has an unused model in the game files. Bearmon evolves from Nyaromon if trained at noon, and can evolve to Aquilamon, Dobermon, Garurumon, Gryzmon, Kiwimon or Leomon X-Antibody. A new warrior! It conceals its grappling abilities within its small frame! This young beast warrior dishes out a strike laced with hidden potential to become a heroic fighter! Despite its cowardice, it also possesses a kind personality which allows it to get along with other Digimon easily. It displays great battle prowess in combat, swinging its leather belt-protected fists. 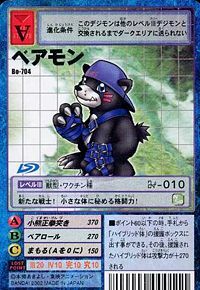 A Beast Digimon with the appearance of a bear-cub, whose trademark is its baseball cap which is worn backwards.